The safety of an area is always top of mind when searching for a new home. Statistics Canada recently released their study on police-reported crimes in 2015. The 2015 report examines the Crime Severity Index (CSI), which measures the volume as well as the seriousness of each crime in comparison to others. This year marked the first time in 12 years that Canada experienced an increase in CSI -- up five per cent year over year. The overall volume and severity of violent crime was up six per cent, while non-violent crime was up four per cent from 2014 to 2015. The significant increase in Alberta's police-reported crime contributed to the national increase. On a positive note, however, the CSI is still 31 per cent lower when compared to ten years ago in 2005. This rise in the CSI is largely attributed to more incidences of fraud, breaking and entering, robbery, and homicide. More than half -- eight out of 13 provinces and territories -- reported an increase in the CSI by the end of last year.Alberta experienced the largest increase (+18 per cent), which was largely attributed to more reported incidents of breaking and entering, theft of $5,000 or under, and motor vehicle theft. This was followed by New Brunswick (+12 per cent), the Northwest Territories (+10 per cent) and Saskatchewan (+10 per cent). Ontario's increased two per cent, due to a rise in police-reported fraud. 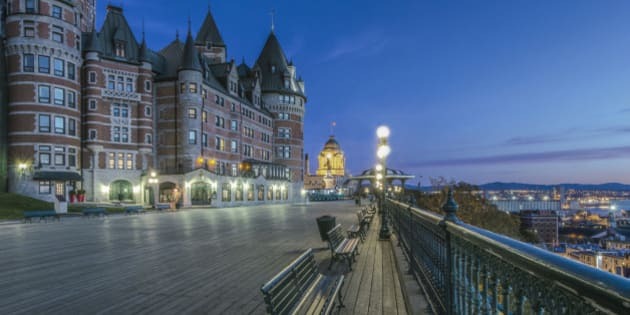 However, there were a number of provinces and territories that witnessed a decrease in CSI including, Prince Edward Island (-10 per cent), Nova Scotia (-7 per cent), Nunavut (-4 per cent), Quebec (-3 per cent) and Yukon (-2twe per cent). Out of the 33 census metropolitan areas (CMAs), 20 reported an increase in CSI. Moncton had a 20-per-cent increase in CSI, Victoria and Edmonton both experienced a 16-per-cent increase, and Abbotsford-Mission had a 14-per-cent increase. Calgary was up 29 per cent -- the largest year-over-year increase. This jump was largely due to an increase of breaking and entering, theft under $5,000 and motor vehicle theft. These types of crime were also responsible for the uptick in New Brunswick, Saskatchewan and the Northwest Territories. Saskatoon and Regina had the highest increase in CSIs, a trend that has sustained itself since 2010, with a 112.5 and 107.6 CSI respectively. Other cities with high CSIs were Edmonton, Kelowna, Abbotsford-Mission and Vancouver. These cities also experienced an increase in traditional crime rate, which looks at the volume of police-reported crime relative to the population size, and led to a national increase of three per cent. The highest increases were found in Calgary, with a 25-per-cent increase, and Moncton, experiencing a 21-per-cent increase. However, similar to the CSI, crime rates have also been on a downward trend since the early 90s. Naturally, notable increases in both CSI and crime rate raise questions about safety in cities across Canada. 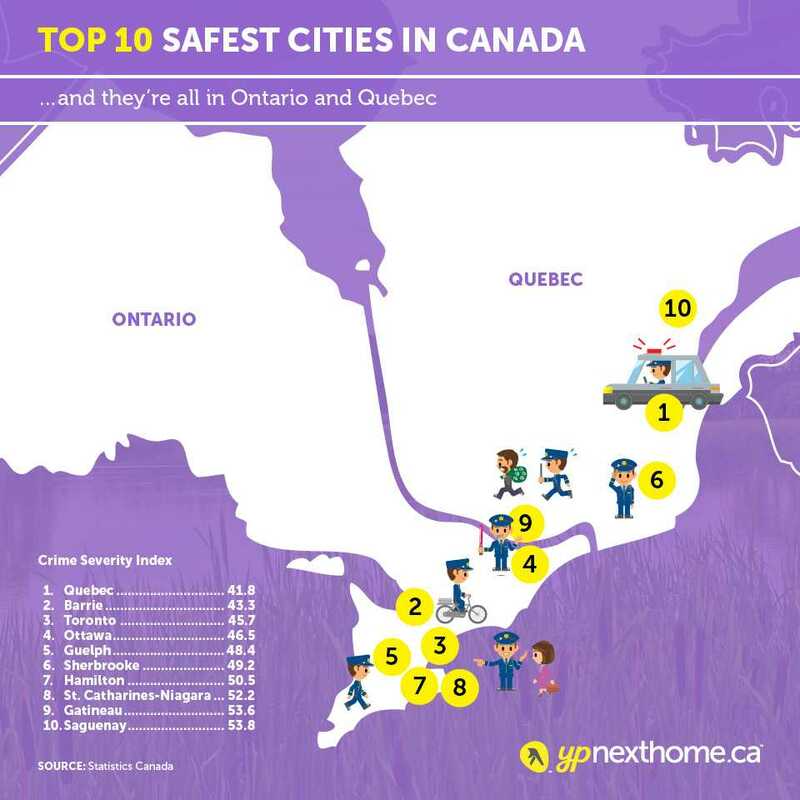 That said, we've rounded the top 10 safest cities, based on data from Statistics Canada. So which ones came out on top? Hint: the safest cities all reside in two provinces, Ontario and Quebec. View full report by Statistics Canada.